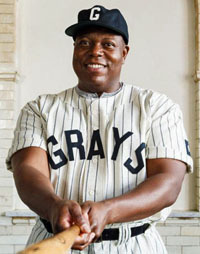 "If they ever let him play in a small place like Ebbets Field or old Fenway Park, Josh Gibson would have forced base­ball to rewrite the rules." After leading St. Louis to its first pennant in 1926, Hornsby didn't return for the next season. 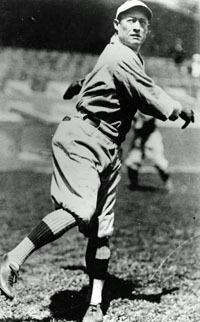 Playing with the Red Sox only because of World War I, George Whiteman became an unlikely hero in the 1918 World Series. 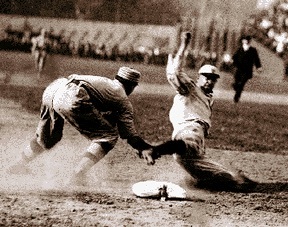 Detroit demanded police protection for Ty Cobb as the club began a crucial series in The City of Brotherly Love before an overflow crowd. First P to strike out 300 batters after 1900. 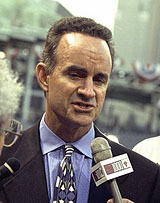 With a month left in the 1997 season, the Indians' once comfortable lead in the American League Central had dwindled. A loss to the Angels left them just six games above .500 and two-and-a-half up on the second-place Brewers. They'd dropped four of their last six games. It was far from the dominance they had come to expect from themselves. Their long West Coast road trip was set to conclude in Anaheim on Aug. 27. That also happened to be Jim Thome's 27th birthday. So somebody, probably designa­ted hitter David Justice, tossed out a casual suggestion. Why didn't all the players that night wear their socks high the way their slugging first baseman did? Thome ended up hitting 612 home runs in 22 seasons before he retired following the 2012 season. He was elected to the Hall of Fame in his first year of eligibility. So, yeah, there were plenty of notable accomplishments and goosebump moments along the way. Yet there was something about '97 that stands out in his memory. On the eve of his Cooperstown induction, the first thing Thome mentions about that pirvotal year was the way the Indians came together after an impromptu fashion deci­sion that was somehow silly and significant at the same time. He went straight to that evening, when he wasn't even in the lineup. After just two innings, the Tribe was down by three runs. Then they exploded for 10 runs in the top of the fourth and cruised to an easy win. Baseball players are supersti­tious, so they decided to keep wearing their socks high when they opened the ensuing homestand. They won four of their next five games. They had a .559 winning per­centage down the stretch. They went to the World Series. And they all wore their socks high every step of the way. "What it did, it brought everybody together from a stand­point of, 'Hey, we're doing this together. We're doing this as a club,'" Thome recalled. "It was a nice gesture and then we just ran with it. Looking back, it was very cool." Understand this: While the Indians had ruled the division the previous two years, and even advanced to the World Series in 1995, this was a different club. 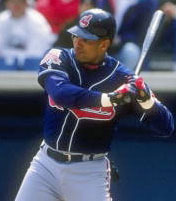 Albert Belle had left as a free agent. Eddie Murray had been traded. 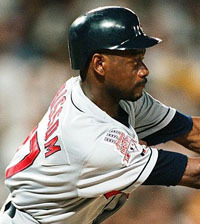 A week before the regular season opened, Kenny Lofton was sent to the Braves for Justice and Marquis Grissom. Matt Williams had been acquired to play third base ear­lier in the offseason. The Indians were a team searching for their new identity. "It's hard to replace Albert Belle. It's hard to replace Ken­ny Lofton. But [the front office] got good players in return. And they got good people. 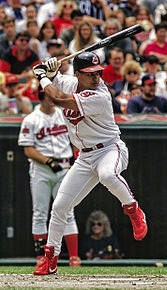 Good teammates who, from the standpoint of our clubhouse and camaraderie and chemistry, fit in really well," Thome said. "You look at every team. You can be good in April and May. But you want to be really good in August and September and October. Looking back, we peaked when you're supposed to." 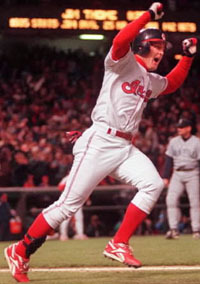 Thome came into his own that year, too. He launched 40 homers and had 102 RBI, a league-best 120 walks and a .386/.423/.579 slash line. He was on his way to becoming as synonymous with Cleveland as the Terminal Tower and the Rock & Roll Hall of Fame. And it all happened while he adjusted to a new position. 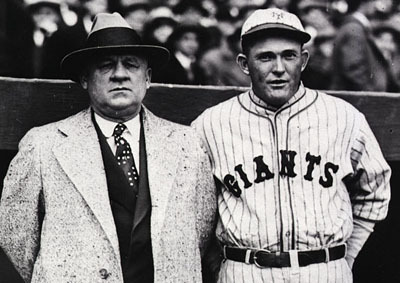 Even though he had spent countless hours with former Gold Glover Buddy Bell to improve his defense at the hot corner, he didn't hesitate when general manager John Hart said he had a chance to get Williams from the Giants. "There was no doubt. 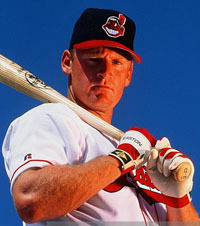 To improve our team, it was a no-brainer," Thome said. "Any time you can get an All-Star caliber third baseman and make your team better, to me it was like, 'Yeah. Let's go. Let's win.'"